Andrea has been teaching yoga since 1998 and has led workshops and retreats around the world, including Richard Branson's Necker Island in the British Virgin Islands, the Omega Institute, the TED Conference, and festivals including Wanderlust, Burning Man, Symbiosis and the Envision Festival in Costa Rica. Andrea is also an international performing artist. As a musician, dancer and installation artist, Andrea has toured since 2001, presenting visually and sonically stunning performances, and transforming architecture and natural environments into large scale musical instruments, including the Coliseum in Rome, the Space Needle in Seattle, the Temple at Burning Man and the Grand Theater in Shanghai. In 2013, Andrea began Sonic Butterfly Productions to unite her talents. 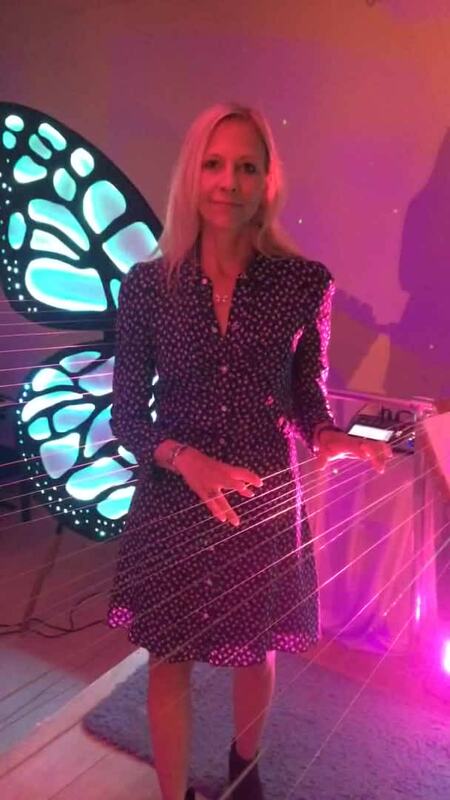 She designed her own long-string harp, Sonic Butterfly, with 26 strings that are at minimum 60ft long, and expand out on each side of the performer and over the audience. 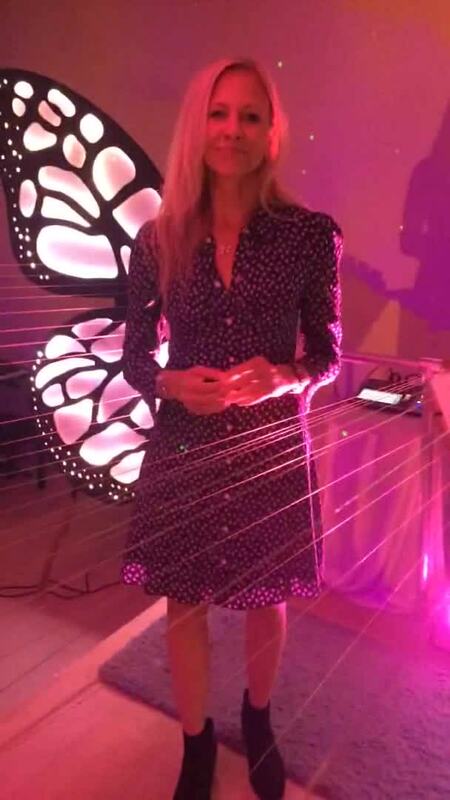 The 2 resonating chambers look like butterfly wings complete with Projection or LED Light wings. Check out my Youtube Channel, CDs: Sonic Butterfly, Becoming..., Elevate, Chakra Beats Instagram: sonicbutterfly_andreabrook. Hey Andrea, could you tell us more about the service offerings of Sonic Butterfly Productions? Sonic Butterfly Productions is at full service performing arts company we offer to solo shows. One is called Butterfly Nature and is the sight sound and story of Sonic Butterfly. And then there is my dance performance which is called Supersonic Butterfly. There are two duet shows Inheritance, Cherry blossom and String to Perplexity which really allows me to work with a violinist and later all of the different experiences of the sounds of the strings. 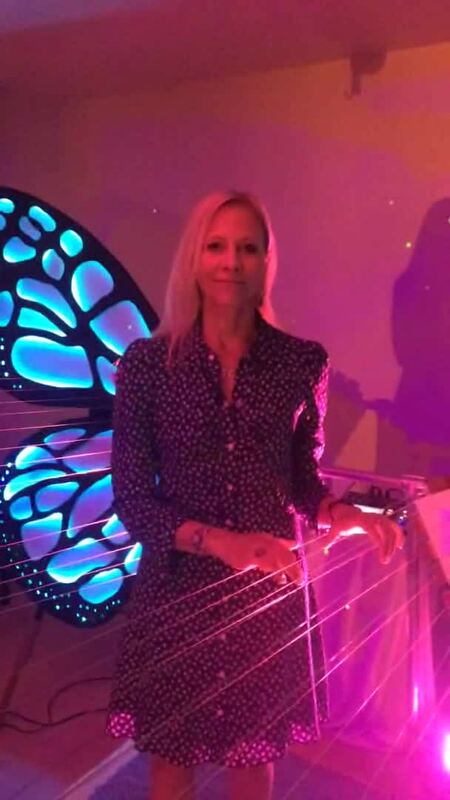 I have two trios shows one is butterfly rhythm which is a rhythm section with SonicButterfly and then a multi-media show which incorporates projections on my projection wings along with Chapman Stick and drums. And then there is the full band performance which is called Kaleidoscope. I also have two workshops a Sonic Butterfly yoga class and Sonic Butterfly tons five rhythms dance. What kind of growth has Sonic Butterfly Productions experienced since it was founded in 2013? Who is its main client base? 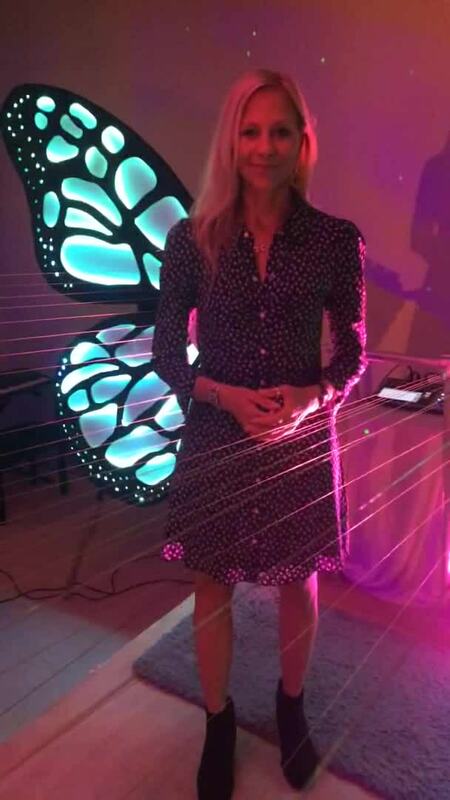 In 2013 I began Sonic Butterfly productions by designing my first sonic butterfly which is my own design of long string harp. At that point I was in a house where we had it set up in the backyard and this was rather between the elements and my neighbors there's a very limited space and not sustainable for a place to have the heart. 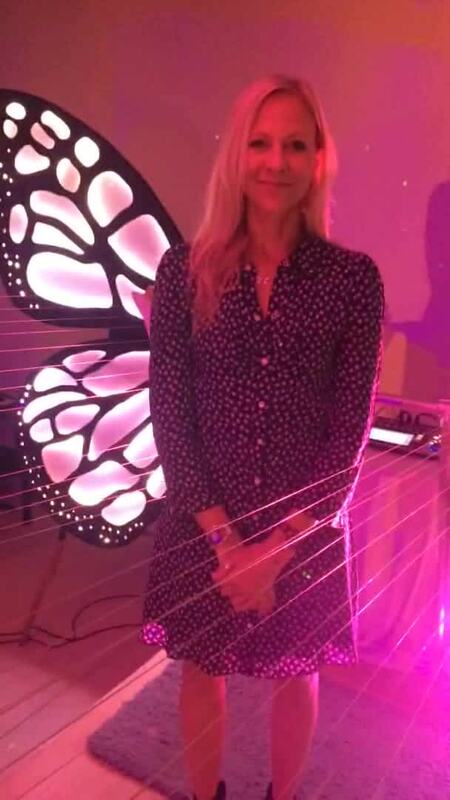 Luckily I was invited to be artist in residence at a beautiful studio called wiz new labs in downtown L.A. and I was there for six months which allowed me to design the projection wings of SonicButterfly. And then from there I found a wonderful home in Ojai, California that had a big open space in the basement and that became the birthplace of everything that I have done since that time I've built my own studio called the Ojai Cocoon. I have designed LED wings so I now have my LED wings and my projection wings. I have two harps and I also have my own venue. In the Ojai Cocoon I offer guest performance series My guest performance series and also our Air BnB experiences and then it offers me the space to have my other musicians come and work with me so that I can design the show design the lighting do the video get everything together in order to present it into the world. My main clients are Corporate events, festivals and also the audience here in Ohio who come from all over the world and come to the Air Bnb experience or the guest artist series. What was it like transitioning from being the Yoga Teacher / Life Catalyst of AndreaBrookYoga.com to your work at Sonic Butterfly Productions? How is your life different now? Well the truth of the matter is is that I'm still andreabrookyoga.com . I'm still a life catalyst. I've been teaching yoga now for 20 years and my focus is on supporting individuals to have a personal practice so that they can set intentions respond to what's taking place in their life and utilize breathing techniques yoga postures meditations in order to help them to consciously physically and energetically move through or bring into being what they what their intentions are. In many ways Sonic Butterfly is a continuation of that focus with Sonic Butterfly is really about inspiring people to recognize that whatever crazy idea they have whatever they feel their purpose is in life that they can take step by step and begin to move that forward consciously and physically in the world through that energetic recognition of what's important to them. And that's really what Sonic Butterfly Productions is. Is this process of step by step. It's about transformation and about purpose and about bringing that message into the world. How different is it playing this type of harp to a normal one? You have practiced and taught yoga and studied mindfulness meditation with Thich Nhat Hahn. Does this mean you always know how to stay relaxed during stressful working days? I'm human like everyone with my peaks and valleys. The thing about peaks and valleys though is that the more extreme they are the more intense they are. And what I found is if I can find balance in my life- so rather than experiencing a pendulum to huge highs and huge lows is there that place in the middle and using the tools that I've gained through studying with up hon or Tubby Joyce or Swan Vivek and on to Sara Swati many other amazing teachers. And then of course in my own personal practice of learning those tools that show me what do we need in this moment. So when I feel myself going to one of those extremes what would be helpful for me. And implementing those tools is fantastic. I also find that music is an incredible way in order to come back down to find a sense of peace. I released an album a couple of years ago on Bandcamp. It's actually available for free on Bandcamp so you can go to Bandcamp.com and search. 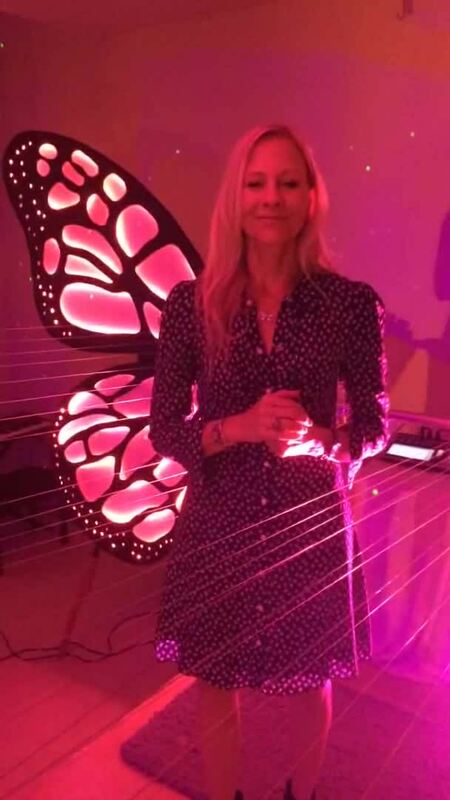 Sonic butterfly Becoming and it is a solo album where I really take you through the stories of feeling into what this harp does and who I am, when I play it. I also have a wonderful album out called Chuck Ruby's and that really takes you through the Chuck Prince and then another album that's about like sort of consciousness on the dance floor. It's called Elevate and that's also available on Bandcamp and I have an album in the works. I feel like the issue with the music industry of today is that it's all or nothing. And this paradigm doesn't work. It's fantastic for the artists who are big stars and we all love the big stars. But what about the many thousands of artists who are out there right now whose music is incredible what about that person who's writing that song that feels like it's being written for you who's creating a brand new instrument or playing their instrument in a way that nobody has seen before. The reciprocal relationship between artist and audience is that we need each other. The audience is seeking that artist that is creating speaking their truth. And the artist is looking for their audience. Nowadays the artists can put their stuff out there. They can build websites they can put their music up on Bandcamp on iTunes through Spotify or up on YouTube. They can shoot videos. We need the audience to seek us out to look for us in those places to be able to recognize where that beautiful reciprocity is. And I invite you as an audience member to come and experience that by visiting my website. Sonic butterfly.com we're going to my YouTube channel or my bandcamp platform and you can find all of that on Sonic butterfly.com and I also invite you to come right here to the Oh hi cocoon and have your own sonic butterfly Oh hi musical journey.